Facilitated by Kelly Keenan, Kevin O’Connor and in dialogue with the invitees and the community, The Movement Educator’s Forum aspires to demystify what the teacher in the studio next to you, or the week after you is doing; to exchange knowledge through practice and generate dialogue between practitioners. The Movement Educator’s Forum chooses a broad theme topic and invites movement practitioners to share their knowledge on the topic through their practices. Thinking through training, this year’s topic METAPHOR & MOVEMENT inquires into how different metaphors, imagery and models shape practice and produce corporealities. Acknowledging that there is not a “universal body” and that different practices produce differences, each unique training enacts a new body. The use of metaphor has been prevalent in movement training for ages. Mabel Todd, author of The Thinking Body, was an early articulate in the 1930’s on the subject and introduced the term Ideokinesis to describe the process whereby imagery stimulates kinaesthetic sensation that instigates bodily change. The use of images, models, metaphors and simile in movement training to impart particular ways of body knowing to others is remarkable and unique in the work of many teachers and techniques (eg/ Bonnie Bainbridge Cohen, Body Mind Centering; Eric Franklin, Franklin Method; Joan Skinner, Skinner Releasing Technique). This year’s Movement Educator’s Forum celebrates the body multiple and looks at the images, models, metaphors and simile as a way to move into practice and “see/feel” what they do. The stellar team of invitees include Eryn Dace Trudell (Skinner Releasing Technique), Katie Ward (Franklin Method), Sylvie Fortin (Feldenkrais), Marc Boivin (Contemporary Dance) and hopefully James Viveiros (Gaga People/Dancers). During each 2-hour class lead by our invitees those present will be invited to participate while attending to the use of metaphor. Each invitee will help us think about and articulate the body in a new way. Throughout the week those present will be invited to engage in a collective listing of metaphors of the body. This will serve as a word generator and launching pad for conversation and experimentation in a lab session facilitated by Kevin O’Connor and Kelly Keenan at the end of the day. The MEF is intended for movers with a teaching practice but welcomes movement enthusiasts who are interested in movement teaching and the topic of Movement and Metaphor. Kelly Keenan is a Montreal-based dance artist and teacher. Her fascination of the perceptive capacity of the body is reflected in both her teaching and artistic work. Her teaching strives to create a positive, physical and experimental context for movers to experience refinement, pleasure and empowerment through dance. Strong influences include the Axis Syllabus, Anatomy Trains, Cranio Sacral, Feldenkrais, Material for the Spine among others. Read her full biography. Kevin O’Connor is a multidisciplinary artist working as a choreographer, dancer, improviser, circus artist and installation artist from Ontario, Canada and now based in the Bay area. He is involved in a decade-long artistic collective exploring participatory de-colonizing performances within polluted watersheds in Ontario. Read his full biography. By working from the idea that our brains are plastic – able to transform – the Franklin Method uses mental imagery to transform the body and improve it’s function. It can be applied to condition any physical practice. The Franklin Method teaches dynamic alignment and ways to move with maximum efficiency. Katie will lead a class heightening our proprioceptive awareness by focussing on imagery that inspires and influences movement. 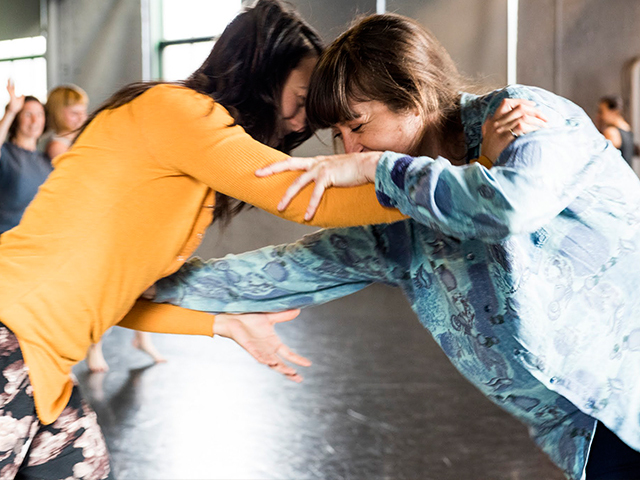 Katie Ward lives in Montreal and works in the field of choreography and movement education. Her work is currently driven by her curiosity around how we perceive various worldly phenomena and how we can alter our perceptions and interact with them. By working to re-order and reimagine everyday perceptions Katie aims to produce new physical embodiments. This method applies to her choreography as well as to her movement teaching. Katie teaches Pilates and the Franklin Method to a variety of students throughout Montreal, she also has a Master of Theatre Practises from Artez University in the Netherlands. The Skinner Releasing Technique (SRT) is an inclusive dance technique designed for professional dancers, actors, and musicians as well as for people with little or no formal dance training. It is a practice for all those with an interest in engaging in the dynamic dialogue between imagination and movement. Guided poetic imagery, music and hands-on partner studies facilitate deep kinaesthetic experience of movement. The practice stimulates the process of letting go of one’s tension and holding patterns releasing new possibilities in how we perceive and how we dance. SRT’s founding principals are based in the Alexander Technique and then applied to the dancer. Joan Skinner is the dance pioneer who began introducing concepts of “Releasing” into her teaching: resulting in an influential and alternative way of studying dance which has now influenced contemporary dance practices as we know them today. As a dance artist: producer, presenter, entrepreneur, choreographer, performer and teacher, Eryn Dace Trudell has experience in all aspects of dance from thought to stage. She holds a BFA in Dance from Juilliard, is a certified facilitator of Skinner Releasing Technique™ and a practitioner of Contact Improvisation (CI). She is currently pursuing a Masters degree in dance at the Université du Québec à Montréal. Ms Trudell’s students include professional and non-professional adult dancers, educators, children, and parents with their children. She particularly enjoys inclusive dance practices, which ignite community spirit and collective consciousness through artistic aesthetic physical exploration. Founder and Artistic director of MamaDances ( 2006) Eryn, is also the mother of two children. Dance technique could be presented as “the appropriation of tools in order to accomplish what we desire, and a moulding of the body and mind, to render a chosen communication with the audience (i.e. a performance).” When we train we aim to integrate the completeness of an aesthetic so that all its components may flow within us. In training, we also look to decipher these components so as to be able to recreate our own synthesis. Technique is a vehicle; it is the bridge between inspiration and matter. In the context of a dance class (having a specific viewpoint, methodology and content) it is impossible for the dancer to train daily without connecting to the threads of self-perception, personal comprehension and consciousness- private areas that as a teacher I must respect. It has always been that dance calls upon the whole being; it is this being which is at play and which is the play (En interprétation l’être entier est en jeu, l’être entier en est l’enjeu). Imagery in dance weaves from the perception of self and the perception of the world, as a specific environment within which human movement evolves. Using the format of a traditional contemporary dance technique class, we will look together at the impacts/stakes associated with the use of imagery in teaching dance. Dancer, improviser, teacher and choreographer, Marc Boivin begins his dance career at Le Groupe de la Place Royale in Ottawa under the directorship of Peter Boneham and in 1985 joins Ginette Laurin and her newly formed company O Vertigo Danse. Since 1991 he has worked as an independent dancer, performing among others for Louise Bédard, Mélanie Demers, Sylvain Émard, Jean-Pierre Perreault, Tedd Robinson and Catherine Tardif. Boivin has been an influential teacher with L’École de dance contemporaine de Montréal since 1987 and regularly guest teaches and choreographs in schools and professional organizations across Canada. He has been president of the Fondation Jean-Pierre Perreault since 2006, president of the RQD (Regroupement québécois de la danse) from 2010 to 2014 and sat on the board of the Montreal Arts Council from 2005 to 2010. A short Feldenkrais group class, followed by an individual hands-on activity, will offer us the occasion to question how the Feldenkrais method can contribute to develop one’s self-image (or in recent terms to explore the plasticity of one’s identity). Any training of bodily perception can be an empowering as well as a subjecting technique. Therefore individual agency will be addressed critically with socio-political aspects of embodiment. However, in self-knowledge, one cannot get at fundamentals without addressing how experiencing the world is embedded or not in language. Carefully choosing words is of prime importance when teaching since the manner in which a teacher speaks to the students partially conditions the possibilities for their individual experiences. Using words to go beyond language will be discussed as a way to open up the complexity of one’s embodiment. Sylvie Fortin, Ph.D. is full professor at the Dance Department of the University of Quebec in Montreal. Using both dance and the Feldenkrais Method, she has worked with professional dancers as well as children and adults with diverse issues such as fibromyalgia, depression, eating disorders, neuromuscular diseases, as well as stroke patients and people with addiction problems, in the context of research projects in hospitals and rehabilitation centers. She is well known as a prolific author. The international recognition of her work has led her to give conferences and workshops around the world. In Montreal, she has a private practice at Espace 212 an interdisciplinary health clinic. James Vivieros is a dancer, performer, choreographer, and certified Gaga teacher from Montreal. He graduated from the Grant MacEwan College in both the Music Theatre and Dance Programs. A former member of Compagnie Marie Chouinard (CMC), he has performed nationally and internationally for sixteen years. He has also collaborated with several Canadian companies and choreographers as an interpreter and creator. In 2009, James was a recipient of a Gemini award (ﬁlm and television) alongside the other company members of CMC, for best performance in a Performing Arts Program or series for bODY_rEMIX/les_vARIATIONS_gOLDBERG by CMC. James was awarded funding on two occasions from CALQ to become a certiﬁed Gaga teacher and studied with the Batsheva Dance Company under the direction of Bosmat Nossan and Ohad Naharin in Tel Aviv, Israel.